Working in the area of Plant Genomics and Biotechnology, Professor Tyagi led first successful Indian initiatives on genome-wide sequencing in rice, tomato and desichickpea. This has heralded the era of high throughput genomics in India. Pioneering contributions were made to the area of neo- and sub-functionalization of regulatory gene families in plants during evolution. A transcriptome atlas of water-deficit response and grain development in rice has been generated. Novel genes/alleles were characterized with a view to gain and protect yield. Over-all, >250 publications of international repute have been generated with GS H-index of 67 and 16500 citations. This research is largely an outcome of investigations of national/international collaborators and >120 Post-Doctoral, Doctoral, Master, Fellow and Trainee researchers, carried out under the auspices of several projects executed in his leadership. Hehas delivered over 300 invited lectures and chaired over 50 sessions in national (~50 cities) and international (~15 countries) meetings. In addition, he is serving on Editorial Boards of Transgenic Research, Molecular Genetics & Genomics, Rice, and others. 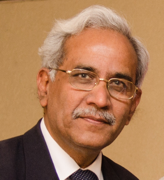 At the University of Delhi, Professor Tyagi has served as Head, Department of Plant Molecular Biology, Chairman, Board of Interdisciplinary and Applied Sciences and Director, Interdisciplinary Centre for Plant Genomics. Professor Tyagi has also provided leadership to the National Institute of Plant Genome Research as Director and to National Agri-food Biotechnology Institute as Executive Director. In his leadership as President, the National Academy of Sciences, India and its Chapters reached about 20000 people, including children, women and those from rural areas, under its science and society program during 2015-16. He served as Chairman of DBT-UGC Task Force on Human Resource Development and Program Advisory Committee on Plant Sciences, DST, Government of India, President, Indian Society of Plant Physiology and on Governing Boards of more than ten institutions. He is serving as Chairman, DBT Task Forces on Star College Scheme, Natural resources and NCS-TCP and as non-official independent Director on Board of Directors, BIRAC. He has been given JC Bose National Fellowship Award, National Bioscience Award, NASI-Reliance Industries Platinum Jubilee Award in Biological Sciences, GM Modi Award for Innovative Science & Technology, Bhasin Award for Science and Technology, Birbal Sahni Medal of IBS, BP Pal Memorial Award of ISCA, and FC Steward Lecture Award of PTCA(I), among others. He is Fellow of the National Academy of Sciences, India, the Indian National Science Academy, the Indian Academy of Sciences, the National Academy of Agricultural Sciences and The World Academy of Sciences. Ranjan R, Khurana R, Malik N, Badoni S, Parida SK, Kapoor S & Tyagi AK. bHLH142 regulates various metabolic pathways-related genes to affect pollen development and anther dehiscence in rice. Scientific Reports 7 (2017) 43397. Malik N, Agarwal P & Tyagi AK. Emerging functions of multi-protein complex Mediator with special emphasis on plants. Critical Rev Biochem Mol Biol 52 (2017) 475-502. Malik N, Dwivedi N, Singh AK, Parida SK, Agarwal P, Thakur JK & Tyagi AK. 2016. An integrated genomic strategy delineates candidate Mediator genes regulating grain size and weight in rice. Scientific Reports 6: 23253. Jain M, Misra G, Patel R, Priya P, Jhanwar S, Khan A, Shah N, Singh V, Garg R, Jeena G, Yadav M, Kant C, Sharma P, Yadav G, Bhatia S, *Tyagi A& *Chattopadhyay D. 2013. A draft genome sequence of the pulse crop chickpea (Cicer arietinumL.). Plant Journal 74: 715-729. (*joint corresponding authors). The Tomato Genome Consortium (TGC*) 2012. The tomato genome sequence provides insights into fleshy fruit evolution. Nature 485: 635-641. (*Co-authored as Coordinator of the Indian Initiative on Tomato Genome Sequencing). Mathur S, Vyas S, Kapoor S & Tyagi AK2011. The mediator complex in plants: structure, phylogeny and expression profiling of representative genes in a dicot (Arabidopsis thaliana) and a monocot (Oryza sativa) during reproduction and stress. Plant Physiol 157: 1609-1627. Giri J, Vij S, Dansana PK & Tyagi AK2011. Rice A20/AN1 zinc-finger containing stress-associated proteins (SAP1/11) and a receptor-like cytoplasmic kinase (OsRLCK253) interact via A20 zinc-finger and confer abiotic stress tolerance in transgenic Arabidopsisplants. New Phytol 191: 721-732. Kathuria H, Giri J, Nataraja KN, Murata N, Udayakumar M & Tyagi AK. 2009. Glycinebetine-induced water-stress tolerance in codA-expressing transgenic indica rice is associated with up-regulation of several stress responsive genes. Plant Biotech Journal 7: 512-526. The International Rice Genome Sequencing Project* 2005. The map-based sequence of the rice genome. Nature 436: 793-800. (*Co-authored as Coordinator of the Indian Initiative for Rice Genome Sequencing). Mukhopadyay A, Vij S and Tyagi AK2004. Over-expression of a zinc-finger protein gene from rice confers tolerance to cold, dehydration, and salt stress in transgenic tobacco. Proc Natl Acad Sci USA 101: 6309-6314. Chen C, Presting G, Barbazuk WB, Goicoehea JL, Blackmon B, Fang G, Kim H, Frisch D, Yu Y, Higingbottom S, Phimphilai J, Phimphilai D, Thurmond S, Gaudette B, Li P, Lin J, Hartfield J, Main D, Sun S, Farrar K, Henderson C, Barnett L, Costa R, Williams B, Walser S, Atkins M, Hall C, Bancroft I, Salse J, Regad F, Mohpatra T, Singh NK, Tyagi AK, Soderlund C, Dean RA & Wing RA. 2002. An integrated physical and genetic map of the rice genome. Plant Cell 14: 537-545. Mohanty A, Kathuria H, Ferjani A, Sakamoto A, Murata N, Mohanty P & Tyagi AK. 2002. Transgenics of an elite indica variety Pusa Basmati 1 harbouring codA gene are highly tolerant to salt stress. Theor Appl Genet 106: 51-57.